Delivery and set-up of sheds and gazebos is free for the first 30 miles when purchased from one of our sales locations. There is a nominal fee of $3.00 per mile thereafter for buildings 12 feet wide or smaller and $5.00 per mile for buildings 14 feet wide. Proper planning is vital to help ensure delivery can be made properly. Please review this entire page for helpful tips on how to plan for successful delivery. If the site is not ready, causing a delay exceeding one hour, extra fees at the rate of $100 per hour will be charged and due on delivery. If the building is delivered within the terms of the contract, and for any reason, the driver is unable to complete the delivery and must return later, a $200 fee is required to have the building re-delivered. There may also be anchor requirements depending on the size of the structure. All towns, and even homeowner's associations, may have different regulations. As such, Liberty is unable to give specific advice in this area. For an additional fee, Liberty Storage Solutions can provide a certified package that includes engineered drawings and anchors. Please speak with your local sales representative for details. A LEVEL SITE: Preparing a level site is critical. The pad must be perfectly level, square, and without voids or rises. If the pad is not level, we would add blocking to level the building. On gravel or stone pads, the blocks could sink faster than the rest of the building and become uneven over time. A level site is even more critical the larger the building. MATERIALS: For the best results, use a 4x4, 4x6 or 6x6 treated wood perimeter. Fill the area with 3/4" crushed stone. Do not use smooth rounded stone or river bed stone. A concrete pad can also be used. The concrete pad should be as close to the ground level as possible. The concrete should be level. Any voids or rises may result in water pooling that could ultimately result in rot and decay. SIZE: The stone pad should be at least 2 feet longer and 2 feet wider than your shed. This allows for proper drainage and will help keep vegetation, and the resulting moisture, away from your shed. Want to prepare a level, gravel pad but not sure where to start? No worries! We have partnered with a local excavating team that has the expertise to provide this service for you. See your local sales person for details. YARD SLOPE: The slope in the yard will have an impact on how much the shed is leveled. And looks can be deceiving! To determine how high a unit may need to be placed up on blocks, use a string level to check the grade. For detailed instructions, view the video above labeled "Planning for Elevation Highs & Lows". Keep door placement in mind when ordering your shed. It is best to place the doors facing where the shed will be closest to the ground. SHED CLEARANCE: The width and length of a unit being delivered should be considered when planning for delivery. While we can get through some tight spaces with the help of our state of the art delivery equipment, there should be enough space for the shed to make adequate turns. Sharp turns with obstacles such as trees, or buildings in the way can lead to shed damage or failed delivery. The longer the shed, the more room is required for the shed to pivot around turns. NEIGHBOR'S PROPERTY: If Liberty needs to pass between houses to reach the delivery site, consider the landscape. 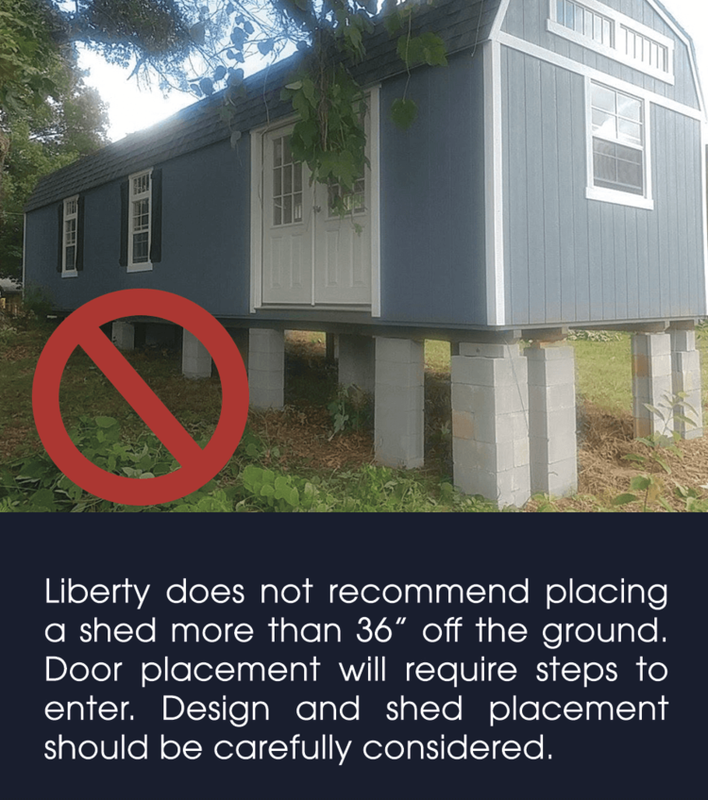 If there is significant slope between the houses, the shed can tilt and become dangerous if there is not enough clearance. Be sure to look for utilities like air conditioner units that can be overlooked in planning. If the site is not ready, causing a delay exceeding on hour, extra fees at the rate of $100 per hour will be charged and due on delivery. If the building is delivered within the terms of the contract, and for any reason, the driver is unable to complete the delivery and must return later, a $200 fee is required to have the building re-delivered. This pictured site was not properly prepared for delivery, resulting in the customer cutting down trees and branches throughout the delivery process. If you still have questions about how to plan for shed delivery, contact your sales person for advice. For questions regarding a scheduled delivery date or time, you can reach out to the Delivery Manager during regular business hours (Monday through Friday, 9am-5pm) at 828-536-0058.